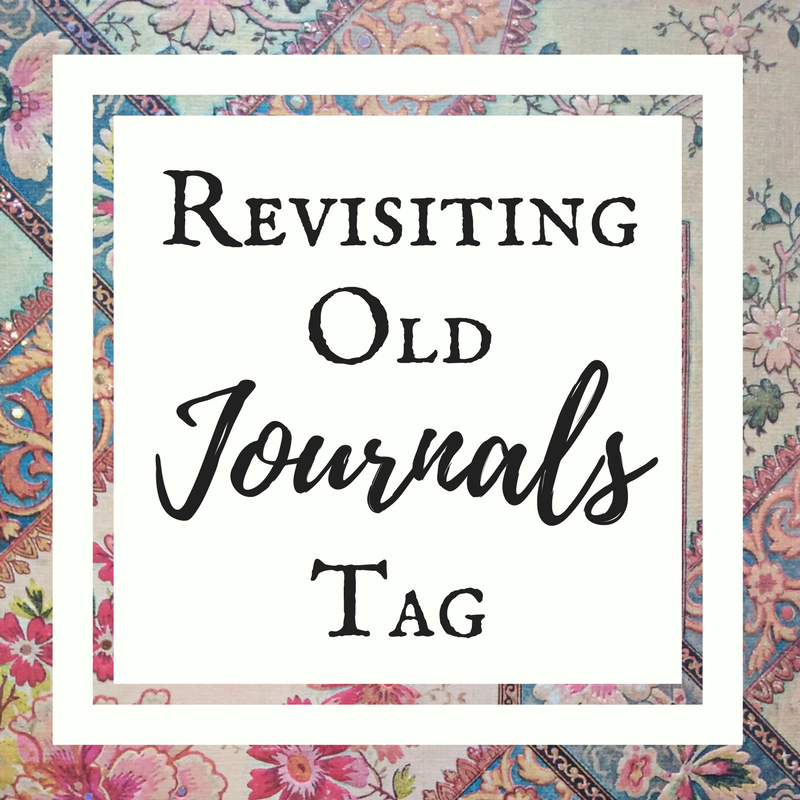 Go through your old journals (writing or otherwise), and share something from them: from world-building to sketches, to random quotes, to an entry, to short snippets of writing! And if you feel like it needs explaining, go for it! Tag at least five other bloggers. Feel free to use the header image! I love journaling. I mean I've done two posts about it so far (three counting this one). The Art of Journaling and Smile Every Day, Then Write Why. First, I have a lot of journals! I'm currently on #34. I'm going to share about my first journal, and the first three pages of it, since that won't be too embarrassing I hope. One of my aunts gave me this for my ninth birthday. I had never heard of a journal before and it felt weird at first, but I loved it! And I named all the cats on the front cover—Angel, Roxy, Tosa, Pretty, and Little. That word on line seven should be spelled Guatemala. My spelling was obviously atrocious bath then. I wish I could say it's much improved, but I'm afraid it's only a little better. 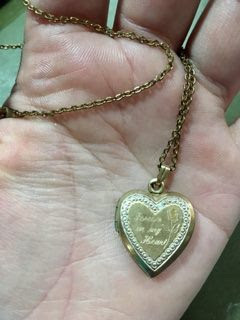 I still have that locket that I mentioned in the first entry, though the original chain broke a long time ago. I tag Rakayle, Gray, Erudessa, Khadija, and Megan. 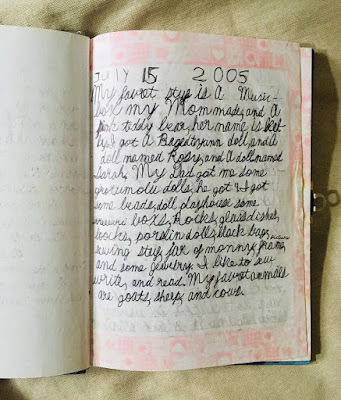 If you journal, how old were you when you started? 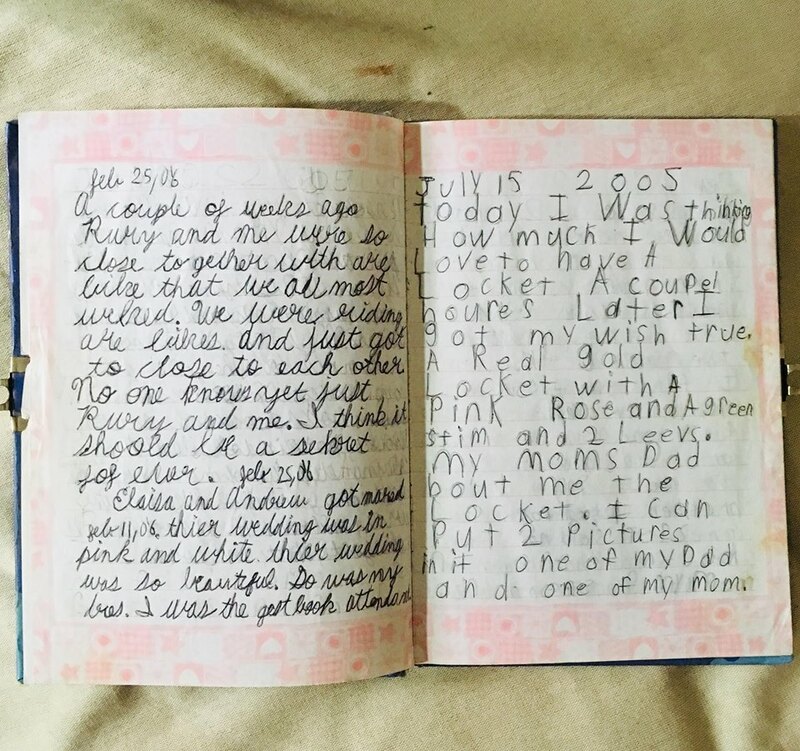 Do you remember when you first heard of the world journal or diary? Oh man, old journals can be so painful to look at. 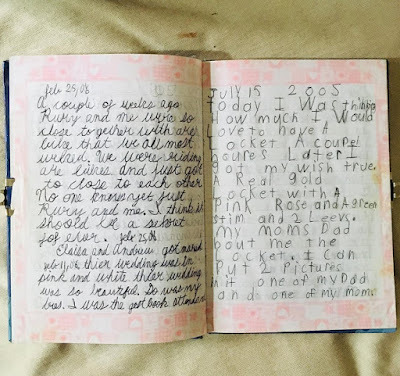 xD I think I started journaling when I was six, and some of the things I wrote in that first little pink diary were just so dumb. Like when I wrote "My favorite color is pink, and this diary is pink, but that has nothing to do with my favorite color being pink." I mean... thanks for clarifying. 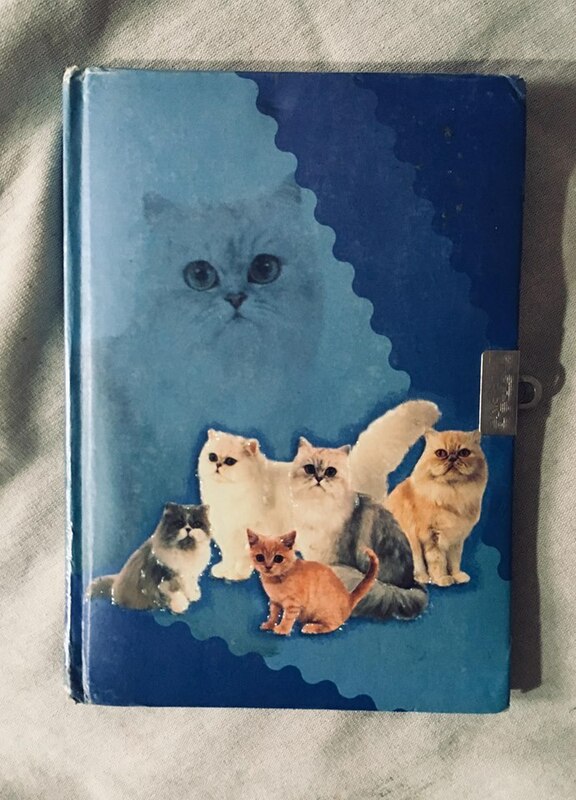 And I love how you named all the cats on your journal, haha! I think I probably would have done the same thing. Thanks! I LOVED cats, but that definitely had nothing to do with THAT being my first journal ;) (see what I did there, copying your younger self? I really think it's so cute). Ah, they're all so pretty! (Is that picture really your stash?? Whoa, that's a lot!) 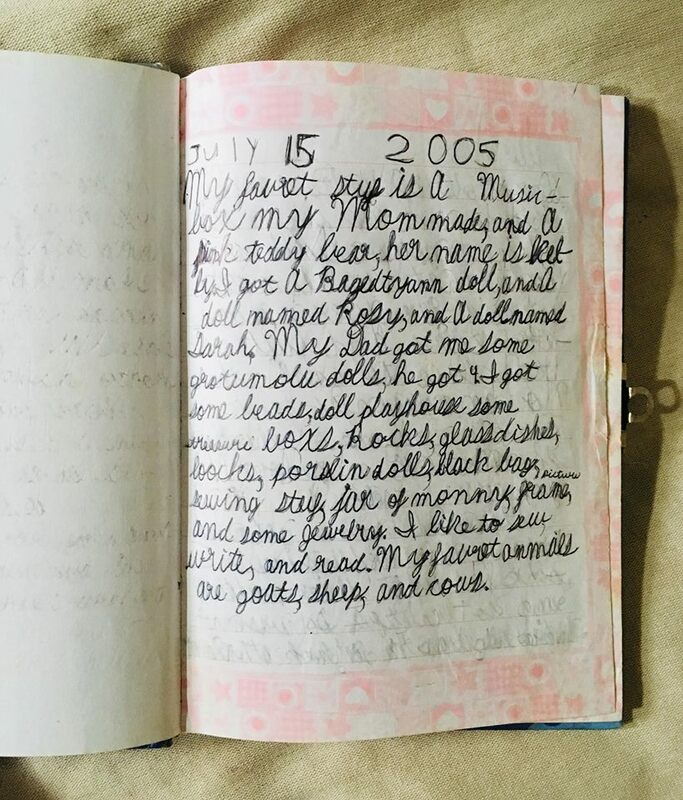 But so cool that you've been able to keep up journaling for so many years. 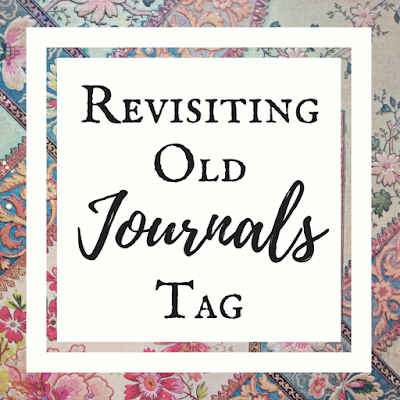 I've always been on and off journaling all my life-now I stick to "updating" it once or twice a year with a few pages detailing what my family is up to and how I'm doing Spiritually and all that. My spelling has never been the best either :). That is a lot of journals! I don't journal a lot but I do a little once in a while. Spelling is just horrible ;d You're welcome! 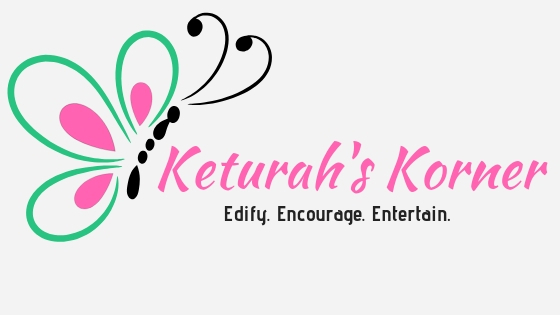 Thank you so much for the tag, Keturah! This looks fun! Cute? I never thought writing could be that - thanks! 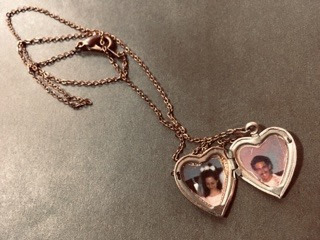 Aw I love the entry about the locket!! It's so sweet. <3 Haha don't worry, your spelling was way better than mine was when I was younger! Hopefully we've both improved since then! Thanks so much for joining the tag!